In 1993, Tony Magee, who had foundered at every job he'd ever had, decided to become the founder of a brewery. So You Want to Start a Brewery? is the thrilling first-person account of his gut-wrenching challenges and unexpected successes. Based in Petaluma, California, the Lagunitas Brewing Company makes craft beer that is simple and flavorful and defies categorization. The same could be said for this book. Equal parts memoir, narrative, and business story—with liberal dashes of pop culture and local color—this honest yet hilarious account of a one-of-a-kind, made-in-America journey just happens to culminate with the success of one of the nation's most popular craft beer brands. In twenty years, Lagunitas has grown from a shoestring operation to be the fifth largest—and the fastest growing—craft brewer in the United States. 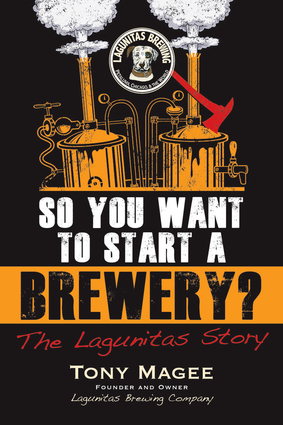 First published in a limited edition two years ago by a tiny California press, So You Want to Start a Brewery? has here been revised and updated to include Lagunitas's establishment of a new brewery in Chicago, set to open in 2014. So You Want to Start a Brewery? is unglamorous and full of entertaining digressions, but it's never afraid to mess with the nuts and bolts. This is a must-read for all who have considered starting their own business—or have sweated blood working to get one on its feet. Told in the vibrant voice of Tony Magee—the man closest to the process—this blow-by-blow chronicle will introduce beer drinkers and entrepreneurs to the reality of starting a craft brewery from the ground up.